Could cannabis help you lose weight? Here's why you shouldn’t be afraid of the ‘the munchies’. Will cannabis make you eat everything in sight? You might be surprised to learn that cannabis can actually help with weight loss. True, increased appetite is one of the most famous side effects of cannabis consumption. Commonly referred to as “the munchies”, cannabis inspires consumers to seek out and enjoy food. For many, an appetite boost is a welcome phenomenon. Yet, the concern that cannabis will cause you to eat uncontrollably and make you fat is misguided. Will consuming cannabis make me fat & eat everything in sight? The short answer to this question? No. There is no doubt that cannabis can make you hungry. Research suggests that the primary psychoactive in the herb, tetrahydrocannabinol (THC), engages with cell receptors in the brain that stimulate the release of the primary hunger hormone, ghrelin. Hormones are powerful modulators of behavior. For this reason, many people find themselves eating more than normal after consuming cannabis. On average, cannabis consumers are estimated to eat an additional 600 calories per day when compared to non-consumers. However, there is no evidence that suggests that cannabis does not independently make you fat. In contrast, there is a growing body of research that suggests that the opposite is more truthful: cannabis may help people maintain a healthy weight. Generally speaking, cannabis consumers have lower body mass indexes (BMIs) and smaller waistlines than non-consumers. Cannabis consumers are also less likely to be obese and tend to have lower fasting insulin levels than their abstinent counterparts. You may be wondering: how can cannabis lovers eat more and yet still weigh less and have lower risks of obesity and diabetes than non-consumers? The answer to this conundrum might surprise you. 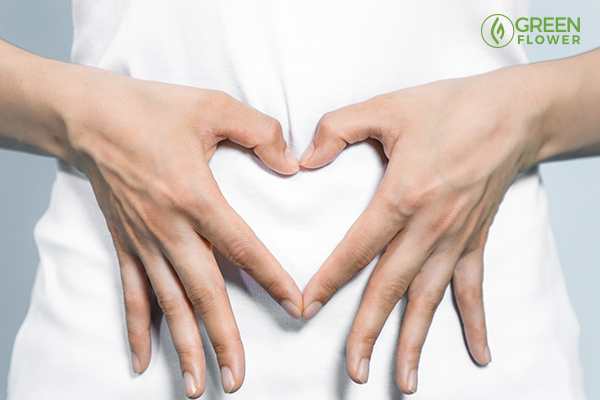 Have you heard about the gut microbiome? There’s a lot more to weight gain than calories in and calories out. While yes, eating substantially more calories than normal with little physical activity can certainly contribute to weight gain, this is far from a complete picture in how the body manages weight and fat storage. Believe it or not, the 4.4 pounds worth of microorganisms living in your intestinal tract may have an enormous impact on how you gain weight and store fat. The gut microbiome is an emerging target in obesity research. Already, studies have found that taking intestinal microorganisms from lean mice and giving them to obese mice causes the obese mice to lose weight and look more like the lean mice over time. As it turns out, compounds unique to the cannabis plant can also have beneficial effects on the gut microbiome. A study published in PLoS One in late 2015 discovered that regular treatment with THC successfully prevented the effects of diet-induced obesity in mice. In the study, THC treatment prevented weight gain in mice even though they were fed a high-fat diet that would otherwise cause them to gain weight. As the researchers investigated, they discovered that chronic THC treatment altered the gut microbiome. Specifically, the cannabis compound changed the ratio of bacteria living in the intestinal tract from one that was pro weight gain to one associated with balanced body weight. While this perhaps sounds too good to be true, this makes sense when you consider the function of THC for the cannabis plant. One of the reasons scientists speculate that the plant produces THC is for protection against fungal and bacterial pathogens. Not all bacteria and fungi are harmful to the plant, however. There are many microorganisms that help the plant thrive and reproduce. Thus far, researchers have discovered that THC has potent antibacterial properties and can even kill the bacteria responsible for dreaded MRSA infections, which is resistant to antibiotics. When consumed orally, as this early rodent research suggest, cannabis compounds may help modulate the human microbiome. Food is thy medicine. Or thy poison. Only you can decide what to eat. Regardless of the herb’s impact on the microbiome, it can stimulate your appetite. It’s entirely possible to control cravings and make informed food decisions after consuming cannabis. Why are you so afraid of eating? 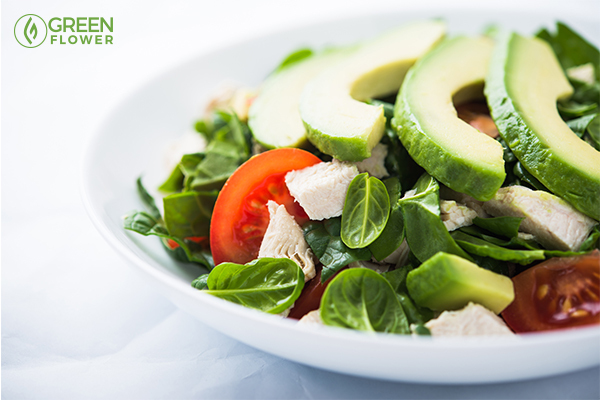 Apart from breathing and drinking water, eating is one of the most important bodily functions. Eating is a major way in which human beings engage with their surroundings and take in information from the environment. The foods you eat contribute to a positive well-being and regulate aspects of your conscious experience. Foods play a part in whether or not you experience chronic pain or poor mental health. Foods can also help prevent debilitating diseases like cancer and minimize your chances of developing degenerative diseases of aging. There is no doubt that eating is a very, very good thing and should be respected as such. Many people often assume that cannabis makes you go hog-wild with sweets and unhealthy foods like pizza and potato chips. Indeed, if these things are handy, you may find yourself eating more of them than normal. However, if you plop down with a nutrient-dense salad and some healthy meats after a little cannabis, you can bet that those vegetables are going to taste like the best darn greens you’ve had in a while. What could possibly be better than a medicinal herb that helps you find greater enjoyment about nourishing yourself? With cannabis, many people tend to eat whatever is fast and on hand to make. If you’re hoping to avoid driving to a fast food restaurant or calling the delivery guy, prepping meals and snacks in advance can help you feel more in control over your food cravings. Don’t want to get too hungry? Opt for micro to low doses of THC over large quantities. Lower doses may still increase your appetite, but cannabis newbies likely won’t feel like their appetite is out of their control. Still concerned about the munchies? Fear not. Some cannabis cultivars do not cause the munchies at all. In fact, they may actually even suppress appetite. Emerging research suggests that cannabis varieties high in cannabidiol (CBD) may suppress hunger. CBD is a non-psychotropic cannabinoid that does not cause a euphoric “high.” Instead, it is lightly energizing and promotes sensations of calmness and ease. Back in 2012 researchers at the School of Pharmacy in Berkshire’s University of Reading tested the effects of three non-psychotropic cannabinoids (cannabis compounds) on feeding in male rats. The team found that while other cannabinoids either increased appetite or had no effect on feeding patterns, CBD treatment was associated with less time spent at the food bowl. Additional evidence suggests that CBD may even decrease some of the appetite-stimulating effects of THC. So, if the munchies just aren’t your thing, opting for a cannabis variety that contains high levels of CBD may help you avoid the side effect altogether. 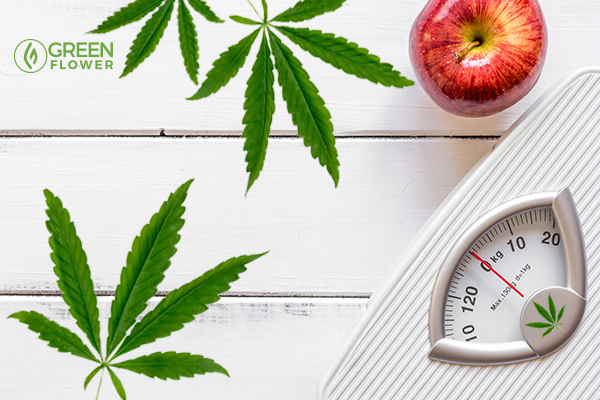 Cannabis Consumers: Would you consider yourself overweight, under weight, or at a health weight?